Malaysia's parliament passed  the “Anti-Fake News Law” on April 3, 2018 amid concerns  that the law will be used to silence the opposition and critics ahead of the General Election (GE14), which will take place in the near term. On the heels of the law's approval, Prime Minister Najib Razak dissolved the parliament  on April 6, in another move seen as part of a strategy for securing his own re-election. Malaysia’s ruling coalition has held power since the 1950s, but recent events have cast doubt over its staying power. The PM has been linked to several corruption  cases which could undermine the electoral chances of his party. These include accusations  that he channeled more than two billion Malaysian Ringgit (nearly USD $700 million) from the 1MDB government economic development company to his personal bank account, a story that was widely reported by local media and denounced by the ruling party. Malaysia is the first Asian country to pass an anti-fake news law, though similar policies have been considered in the Philippines  and Cambodia . 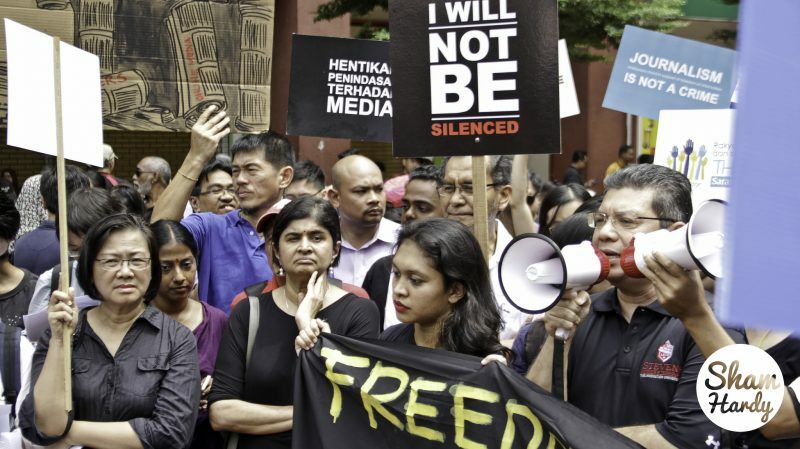 More than 11,000 people signed  online petitions opposing the Malaysian law. The government insists that the new law  is necessary to combat fake news and protect the reputation of innocent people. But various groups argue  that the law could undermine free speech and other civil liberties. The law defines fake news as “any news, information, data and reports, which is or wholly or partly false, whether in the form of features, visuals or audio recordings or in any other form capable of suggesting words or ideas”. For critics of the law, this definition is too vague and can be easily abused by authorities. Those found guilty of publishing fake news content could serve a prison term of up to six years and be ordered to pay a fine of up to 500,000 Malaysian Ringgit (UDS $129,000). Third-party apps, website administrators, and online forum moderators are also held liable if they do not swiftly remove fake news content that is uploaded and distributed via their platforms. The law allows any person to petition a local court for the removal of a fake news content. If the court decides in favor of the petitioner, the order can be served by sending it to the social media accounts of the accused. The government can expedite the application for the removal of a fake news content if it involves public order or national security. Abetting and funding the publication of fake news are also criminalized under the law. The wording of this part of the law could be subject to broad interpretation, to include subscription to news websites or even crowd-sourcing initiatives. The law also intends to prosecute persons and companies promoting fake news about Malaysia, even if the accused is living or operating outside the country. It is an extremely vague Bill: it does not clearly define the malicious falsehood required for the offence, the severity of the ‘fake news’ required before attracting criminal culpability, or the defences that are open to persons accused of publishing ‘fake news’. This Bill threatens to make a mockery of this cornerstone of our democratic rights by declaring all news regardless of the content, whether it is serious or trivial, that are wholly or partly false as a crime, unless of course the authorities determine otherwise. Sensitivities about the reputation of Malaysia by way of negative comments and criticisms can now be attacked through an extremely wide extra-territorial application of the proposed legislation, putting this in the same category as international terrorism, cross-border corruption, money-laundering, and trafficking in persons. While this issue should not be ignored, the proposed broad-based law to criminalise the dissemination of news amounts to legislative overkill. Several analysts also argued that the government can address the fake news problem by reviewing the country’s laws on slander, libel and defamation. With GE14 looming, the passing of the bill becomes even more harmful as it aims to put fear into members of the opposition whose role in politics is to question the government on issues of policy and governance. It does appear however that the Anti-Fake News Bill is yet another dressed-up political weapon to pacify dissenting voices and it should be retracted if Malaysia is ever to become a model of a democratic nation. The ruling party was rendered powerless to defend itself against legitimate criticism and news detrimental to its political survival and seek to have a new law with arbitrary reach to clamp down on freedom of expression with the guise of criminalizing ‘fake news’. Any efforts to genuinely tackle the spread of misinformation online must be approached in a transparent, consultative manner and avoid broad criminal restrictions on speech. …the bedrock that dispels disinformation is government transparency. If the government operates on an information framework, instead of one premised on secrecy, and produces information proactively according to open data principles, fake news itself will be greatly mitigated. It’s a bit sad that the issue of fake news is now being used by politicians in the region against the media to target independent journalism. At its core, ‘fake news’ is a governance problem, as these are produced to mislead the public by pretending to be real news. Real journalists do not produce fake news. They do, however, make mistakes, and they correct these mistakes as part of responsible journalism. But not all  are worried about the passage of the law. To be properly informed is the very least that the Malaysian people deserve. The opposition and some of the media outlets that support them seem to disagree. They may prefer, spin, smears and outright lies – but the Government will continue to fight for the truth. The only people who need to be afraid of our Anti-Fake News Bill 2018 are not those who convey honest opinions, and report conscientiously and truthfully according to proper journalistic protocols. No, the only people that need to be afraid are those that broadcast or pass on fake news – or lies, to you and me. The bill is of a deterrent nature, to give a clear message that each individual should be responsible for the sharing of true and healthy information…The bill will also give a clear message that the government will not compromise in the matter of dissemination of fake news that can undermine public order or national security, and will continue to ensure that national security is preserved. If anyone were to benefit, it will be these media organisations, whose job it is to always verify the news that it sends out. I believe that fake news has, to quite a great extent, damaged the credibility of traditionally-trained journalists. With elections on the horizon, time will soon tell if these guarantees of government officials hold, or if civil society's concerns prove valid.